More great news for accurate blood pressure measurement! Following similar BP device guidelines from the American Heart Association, American Pharmacists Association, American Medical Association, and the US Center for Disease Control, Hypertension Canada has formally announced the launch of its “Recommended Device Program”, which is based on published clinical evidence (not unsubstantiated manufacturer claims). PharmaSmart is proud to be the ONLY kiosk device listed, and one of a handful of devices to earn “GOLD” status recommendation. Key opinion leaders agree: patient blood pressure data is not actionable, and should NOT reside in the clinical patient record, unless it is sourced from an independently validated device. Common recreational kiosks do not withstand professional scrutiny and cannot support professional pharmacy programs. PharmaSmart continues to lead the way in pharmacy hypertension management, and biometric data interoperability. As more pharmacists coordinate care with physicians, and as outcome-based payment models drive the new healthcare economy, data integrity is at a premium. When it comes to patient care, protect your reputation. PharmaSmart’s motto says it all: Backed by Evidence, Trusted by Physicians. Don’t Settle For Less. Please contact us directly with any questions, or to review how PharmaSmart can help your organization achieve its clinical objectives. ROCHESTER N.Y. — PharmaSmart International Inc., a leading health screening, and digital health management company, praised the American Heart Association (AHA) and American Medical Association (AMA) for their joint initiative to create the country’s first validated blood pressure (BP) device listing. The company welcomed the announcement, which will ensure that physicians, pharmacists, and patients have a single, trustworthy reference for identifying clinical-grade blood pressure devices. In a statement published in the “AMA Wire”, the AMA referenced the new 2017 national hypertension guideline that states all BP monitors used for self-measurement should be backed by peer-reviewed, independent clinical validations. In order to be in compliance with these professional guidelines, the AMA stated that patients and physicians need a “comprehensive, unbiased resource” to use when selecting a valid BP device for self-measurement. The AMA and AHA have released the draft criteria for devices to be included in the new listing. The criteria document makes it clear that the FDA status of a device does not substantiate device accuracy, stating, “substantial equivalence, as defined by the FDA and used for 510(k) device clearance, is not sufficient to meet the criteria for clinical accuracy.” Per the draft criteria, in order for devices to be included in the list, the manufacturer must substantiate their claims with quality, independent evidence, using an acceptable international testing protocol. A blood pressure expert quoted in the AMA Wire article noted that not all devices for sale have been validated, that “truth in advertising is always an issue,” and that the current state of the device market is “buyer beware.” The new AMA and AHA device list will cut through the noise, and provide physicians, pharmacists and patients access to a list of devices that have been clinically validated for accuracy. ROCHESTER, N.Y. — PharmaSmart International Inc. will roll out health screening kiosks (model PS2000) at Schnuck Markets in-store pharmacies. Schnucks intends to leverage PharmaSmart’s clinical-grade program to drive Medicare Star Ratings objectives, specifically measuring D-14 (medication adherence for hypertension), and C-19 (controlling blood pressure), both of which are triple-weighted measures of high interest to national and regional insurers. Commercial plans also stand to benefit as they seek to improve cardiovascular outcomes through the reduction of long-term risk factors such as hypertension. ROCHESTER, N.Y. — PharmaSmart International Inc. welcomed new guidelines updating the definition of hypertension and stressing the use of validated devices for measuring blood pressure. The American Heart Association and American College of Cardiology last week announced that high blood pressure is now defined as a systolic reading of 130 mm Hg and higher or a diatolic measure of 80 and higher, compared with the prior level of 140/90. PharmaSmart said Monday that this consensus national guideline is endorsed by nine other national health professional organizations, including the American Pharmacists Association (APhA). Also, the device accuracy guidance comes in the wake of a 2017 CDC/AMA/APhA published Resource Guide for Pharmacists that called for the use of “only clinically-validated blood pressure kiosks” and a 2017 APhA House of Delegates Policy Adoption stating that the APhA supports “peer-reviewed clinical validation testing” and promotes “public awareness of accuracy of BP devices,” according to PharmaSmart. The lowering of the hypertension threshold from 140/90 to 130/80 means that about 50 million more Americans are now classified as having high blood pressure, PharmaSmart noted. PharmaSmart’s blood pressure measurement and health screening stations serve more than 6,500 locations, including such retail chain and independent pharmacies as well as major worksites, military bases, university schools of pharmacy, hospitals and medical clinics. The company’s PS DataSmart Health IT database holds more than 40 million targeted patient blood pressure readings. Pharmasmart and Chain Drug Review Conclude "Pharmacist Challenge"
ROCHESTER, N.Y. — Apple Discount Drugs in Salisbury, Md., came out on top in the “Lower My Blood Pressure” challenge launched last year by PharmaSmart International Inc. and Chain Drug Review. The one-year competition, which began in February 2016, sought to determine which pharmacies could enroll the most patients in PharmaSmart’s Smart Card tracking program and demonstrate the biggest improvement in average blood pressure rates among enrolled patients. Pharmacists enrolled in the contest via the Chain Drug Review or PharmaSmart websites. PharmaSmart biometric screening kiosks and health IT technology took patients’ blood pressure readings and streamed them to its PS DataSmart secure, HIPAA-compliant data center. Qualified clinicians then assessed confidential data. Apple Discount Drugs on Fruitland Boulevard in Salisbury achieved the largest overall improvement in blood pressure control — with an average reduction of 16 mmHg systolic and 6 mmHg diastolic — and won the grand prize, an all-expenses-paid trip for two to Miami. “We are honored as we strive to make an impact on patient health,” commented Jeff Sherr, owner of Apple Discount Drugs. A Health Mart pharmacy, Apple Discount Drugs has two locations in Salisbury and one in Berlin, Md. The Apple group also includes Apple Infusion in Salisbury, Md., which provides infusion and enteral therapy; Advantage Medical in Onley, Va., a supplier of durable medical equipment (DME); and Snow Hill Pharmacy, an independent pharmacy in Snow Hill, Md. Three Brookshire Grocery Co. pharmacies also were winners in the blood pressure challenge by generating strong patient enrollment in the PharmaSmart clinical program. Brookshire Pharmacy No. 90 won first place, followed by Brookshire Pharmacy No. 34 and Brookshire Pharmacy No. 62. “We are thrilled that our pharmacy staff from each winning location volunteered to enter into the Lower My Blood Pressure contest. PharmaSmart is a company exclusively focused on helping pharmacists target uncontrolled cases of hypertension. Kudos to both companies for driving such a critical initiative nationwide,” stated Jim Cousineau, senior vice president of operations at Brookshire Grocery Co. Tyler, Texas-based Brookshire has over 150 stores, more than half with pharmacies, in Texas, Louisiana and Arkansas. The goal of the Lower My Blood Pressure challenge was simple: to boost awareness of the need to prevent and manage chronic disease — including such conditions as hypertension — across the retail pharmacy sector and spotlight the bigger health care role that pharmacists can play. PharmaSmart serves more than 6,500 locations — including pharmacies in chain and independent drug stores, supermarkets and other retailers — as well as major worksites, military bases, university schools of pharmacy, hospitals and medical clinics. The PharmaSmart PS DataSmart Health IT database holds more than 40 million targeted patient blood pressure readings. Fred Sarkis, president and chief executive officer of PharmaSmart, noted that the company’s independently validated technology bolsters the clinical credibility of its retail pharmacy clients. Overall, St. Cloud, Minn.-based Coborn’s operates 54 supermarkets across Minnesota, North Dakota, South Dakota, Iowa, Illinois and Wisconsin under the Coborn’s, Cash Wise Foods, Marketplace Foods and Save-A-Lot banners. Coborn’s, Inc. also owns CobornsDelivers, an online grocery ordering and home delivery service; and stand-alone convenience, liquor, video and pharmacy locations. To support its 120 retail locations. ROCHESTER, N.Y. — PharmaSmart International Inc. has teamed up with McKesson Pharmacy Systems on an integrated solution for outcomes-based patient management. PharmaSmart said the integration brings together its clinical-grade, public-use health kiosks with the new McKesson Clinical Program Solutions (CPS), which helps retail pharmacies manage clinical programs directly within their pharmacy management systems. CPS synchronizes PharmaSmart patient data with the McKesson EnterpriseRX pharmacy management system. PharmaSmart kiosks are currently at more than 7,000 locations, including retail pharmacy operators such as Giant Eagle, Brookshire Grocery, Kinney Drugs, Bartell Drugs, Coborns, Nash Finch, Roundy’s, Associated Food Stores, Leader, Good Neighbor Pharmacy, Astrup Drug, Winn-Dixie, Big Y Foods, Harmons Grocery, Walmart Canada, Loblaw’s, Jean Coutu, Shoppers Drug Mart, Rexall, Sobeys and Lawtons Drugs, among others. PharmaSmart’s PS Data Smart Health IT database holds more than 50 million targeted patient blood pressure readings. PharmaSmart International reports that its blood pressure kiosks are in line with a recently released Centers for Disease Control and Prevention (CDC) resource guide for pharmacists. PharmaSmart said Monday that the CDC guide, titled “Using the Pharmacists’ Patient Care Process to Manage High Blood Pressure: A Resource Guide for Pharmacists,” urges pharmacists to use only clinically validated and interoperable blood pressure kiosks. The guide was developed by the CDC in tandem with the American Medical Association (AMA) and the American Pharmacists Association (APhA). Calling on pharmacists to ensure correct measurement, the guide points out that “inaccurate blood pressure measurements have significant public health implications because minor errors can result in the misdiagnosis of millions of people,” according to PharmaSmart. The guide also states that even minor measurement errors of 5 mm Hg can lead to the misdiagnosis and mismanagement of over 20 million people in the United States. PharmaSmart said it’s the only blood pressure kiosks manufacturer with published clinical validation and data interoperability with leading pharmacy software systems that allows easy, rule-based intervention during standard pharmacy workflow. “This CDC publication is important recognition for our clients who have already invested in PharmaSmart and who have advanced from a recreational to a clinical-grade, evidence-based hypertension management program,” Sarkis added. Currently, PharmaSmart has its blood pressure kiosks at more than 7,000 locations, including retail pharmacy operators such as Giant Eagle, Brookshire Grocery, Kinney Drugs, Bartell Drugs, Coborns, Nash Finch, Roundy’s, Associated Food Stores, Leader, Good Neighbor Pharmacy, Astrup Drug, Winn-Dixie, Big Y Foods, Harmons Grocery, Walmart Canada, Loblaw’s, Jean Coutu, Shoppers Drug Mart, Rexall, Sobeys and Lawtons Drugs, among others. PharmaSmart’s PS Data Smart Health IT database holds more than 50 million targeted patient blood pressure readings. the pharmacy point of care. Canada, Loblaw Cos., The Jean Coutu Group, Shoppers Drug Mart, Rexall Group, Zellers, Sobey’s and Lawton’s. ROCHESTER, N.Y . — Giant Eagle is deploying PharmaSmart blood pressure kiosks at its 217 supermarkets and in-store pharmacies. PharmaSmart International Inc. said the rollout includes the food and drug retailer’s Giant Eagle, Market District and Market District Express stores in Pennsylvania, Ohio, Maryland and West Virginia. Rochester NY, Feb 19, 2016. In the largest consensus statement of its kind, twenty-one international hypertension organizations have published a joint “Position Statement” calling on the private healthcare sector and governments worldwide to address the issue of inaccurate blood pressure (BP) devices. Noting inadequate regulatory control and lack of published evidence for many devices, the authors called for immediate action to ensure accurate patient diagnosis and treatment decisions. BLOOMINGTON, Minn. — Results from a community partnership between HealthPartners, Sterling Pharmacy, and PharmaSmart® show the potential of community pharmacists to improve hypertension. Nearly one in three American adults are estimated to have high blood pressure, which can cause heart failure, heart attack, stroke, and kidney damage. The six-month pilot program included 270 HealthPartners members who had a diagnosis of hypertension and a prescription for medication to lower blood pressure at a Sterling pharmacy. Members who enrolled received a Smart Card which allowed them to routinely measure and track their blood pressure on a PharmaSmart® blood pressure kiosk inside the Sterling stores. The clinically validated PharmaSmart® kiosks contain technology to automatically transmit the data into the Sterling pharmacy clinical system. This unique integration allows pharmacists to proactively intervene on the patient’s behalf by recommending a change in dose or a new medication to the patient’s provider. Nearly half of the active members in the pilot program had uncontrolled blood pressure despite the fact that they had a prescription for medication to control it. Sterling pharmacists were able to recommend a change in dose or medication to the patient’s provider. As a result, blood pressure improved for about one third of patients through the course of the pilot, with a mean reduction in blood pressure among the uncontrolled group of -11 mmHg systolic and -8 mmHg diastolic. The pilot program was implemented after a HealthPartners analysis revealed a similar gap between medication adherence and appropriate clinical outcomes. The analysis found that about 85 percent of patients with a diagnosis of hypertension had filled their prescriptions in a timely manner. However, a comparison of pharmacy claims with medical records revealed that for about one third of patients, the medication was not having the desired effect and patients still had uncontrolled blood pressure. “It is well understood that the pharmacist can play a key role in supporting medication adherence. This pilot shows that community pharmacists can add even more value by confirming that the prescribed medication is doing what it is supposed to do,” said Richard Bruzek, vice president of HealthPartners pharmacy services. Based on the promising results of the pilot program, HealthPartners is exploring program expansion in 2016. Astrup Drug is the largest independently-owned community and long-term care pharmacy chain in the state of Minnesota. The company was founded in 1952 in Austin, MN and currently owns and operates 20 pharmacies in southern Minnesota and northern Iowa, operating under the names of Sterling Drug and Smart Pharmacy. For more information visit www.sterlingdrug.com. PharmaSmart®®, headquartered in Rochester, N.Y., currently serves more than 6,500 locations, including retail pharmacies. PharmaSmart’s PS DataSmart® Health IT database currently holds more than 40 million targeted patient blood pressure readings offering pharmacists and physicians a credible, accessible, low-cost solution for monitoring blood pressure that they can recommend to their patients For more information visit www.PharmaSmart.com. their patients lower their blood pressure. clinicians will assess confidential data during the one-year program. website and powered by PharmaSmart’s PS DataSmart health IT database. also will include multiple pizza parties throughout the program’s duration, will be awarded to individuals or groups. well as highlight the broader role that retail pharmacists can play in health care. screening, diagnosis and therapy management. patients,” said Jeff Woldt, vice president and editorial director of Chain Drug Review, based in New York. American Society of Hypertension Guide on Blood Pressure Kiosks Acknowledges PharmaSmart® for its “Unique” Cuff and Published Clinical Evidence. A first-of-its-kind clinical guide for blood pressure kiosks noted PharmaSmart® for its unique cuff technology, and for its peer-reviewed evidence of validity. The guide, published by the American Society of Hypertension, cited the widespread use of invalidated kiosk devices, and urged physicians, nurses, and pharmacists to direct their patients only to qualified blood pressure kiosks. Rochester, New York (PRWEB) June 24, 2015 — The American Society of Hypertension (ASH) has published a first-of-its-kind clinical guideline addressing use and validity of public blood pressure kiosks, entitled “Public Use Blood Pressure Kiosks: A Guide for Clinicians.” The guideline specifically noted PharmaSmart®, a Rochester, NY based leading manufacturer of biometric kiosks, for its “unique” cuff technology “not limited by arm sizes”, and for its peer-reviewed, published clinical accuracy. *Note: In accordance with their policy, the American Society of Hypertension does not endorse PharmaSmart or any other medical device. PharmaSmart®, headquartered in Rochester, NY, USA, currently serves more than 6,500 locations, including retail pharmacies such as Kinney Drugs, Bartell Drugs, Sav-MorRx/Sav-On Drugs, Coborns, Nash Finch, Roundy’s/Mariano’s, Associated Food Stores, Leader, McKesson Health Mart, Good Neighbor, Astrup Drug, Winn Dixie, Big Y Foods, Harmons Grocery, Wal-Mart Canada, Safeway Canada, Loblaw’s, Le Groupe Jean Coutu, Shoppers Drug Mart, Rexall/Katz Group, Sobey’s Lawton’s, and other fine pharmacies. PharmaSmart® also serves major worksites, military bases, University Schools of Pharmacy, hospitals and medical clinics. PharmaSmart’s PS DataSmart® Health IT database currently holds more than (40) million targeted patient blood pressure readings. For more information visit the company’s website at www.PharmaSmart.com or contact Katie Miller at: (800) 781-0323 x338. ROCHESTER, N.Y. — A company that makes health kiosks has joined a campaign to promote blood pressure management among patients with hypertension. PharmaSmart announced Thursday that it joined the “Team Up. Pressure Down.” program, which is part of the Department of Health and Human Services’ Million Hearts initiative, also lead by the Centers for Disease Control and Prevention and the Centers for Medicare and Medicaid Services. The program offers such resources as video vignettes and conversation starters designed to encourage and support pharmacists in providing counseling services to patients with high blood pressure. The campaign’s stated goal is to prevent 1 million heart attacks by 2017. PharmaSmart COO Ashton Maaraba will lead the partnership. The company said it had an existing campaign nationwide to promote validated, pharmacy-based hypertension management as a key element of emerging team care models, and that its representatives were working with healthcare providers and pharmacy retail chains to advance Team Up. Pressure Down.’s message. ROCHESTER, N.Y. — A peer-reviewed clinical study recently published Nov. 19, 2014 in the Journal of the American Society of Hypertension has concluded that routine blood pressure testing on PharmaSmart kiosks “closely approximates” daytime ambulatory blood pressure measurement. Ambulatory blood pressure monitoring is considered the clinical gold standard for the diagnosis and management of hypertension. According to the study authors, the findings “support the use” of PharmaSmart in the assessment of hypertension. The study, using self-measured blood pressure on PharmaSmart kiosks located in “real world” community pharmacy settings, also concluded that routine PharmaSmart measurement yields results similar to validated, averaged, “automated office” blood pressure, widely considered the most robust “in-office” method of assessing blood pressure. ROCHESTER, N.Y. – PharmaSmart health screening stations have been recognized by national experts as the only kiosks that “can be recommended by physicians for their patients” following a Food and Drug Administration consumer update on blood pressure kiosk accuracy. PharmaSmart International Inc. said Thursday that the endorsement marks the first published expert recommendation for any blood pressure kiosk. The JASH statement authors include Dr. Dominic Sica, M.D., president of the American Society of Hypertension, and two national experts in blood pressure measurement, Dr. Richard Dart, M.D, and Dr. Bruce Alpert, M.D. The JASH statement acknowledges the FDA advice and then continues, “There is a device currently available [PharmaSmart] that has undergone full validation testing and offers a wide-range cuff validated for almost all U.S. adult arms,” PharmaSmart reported. Based on the available evidence, including an industry survey, the JASH authors concluded that PharmaSmart is the only kiosk device that doctors can recommend, the company said. 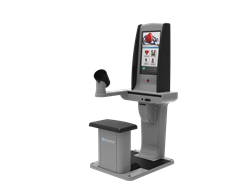 Following an FDA consumer update on blood pressure kiosk accuracy, national experts recognize PharmaSmart as the only kiosk that “can be recommended by physicians for their patients”. The published expert recommendation is a first for any blood pressure kiosk. National leaders in hypertension have acknowledged PharmaSmart as the only blood pressure kiosk solution that can be “recommended by physicians” for patient monitoring. © 2014 Chain Drug Review Al Rights Reserved. ROCHESTER, N.Y. — PharmaSmart International Inc. has introduced its next-generation biometric kiosk, the Model PS2000 Destination, following a pilot at Mariano’s, a Chicago-area food and drug chain. PharmaSmart said Wednesday that the PS2000 Destination is designed to help consumers monitor hypertension, obesity and diabetes. The device measures left and right arm blood pressure, weight and body mass index (BMI), and it’s equipped with the option to upload patient glucose data. Patients get a printed ticket that displays blood pressure, blood sugar and BMI results, in less than three minutes. Patient data is also uploaded to a HIPAA/PIPEDA-compliant cloud server, where the data is made available to partner clinical systems, including major pharmacy software systems, physician EMR systems, PHR’s and consumer mobile devices. The kiosk also features an interactive multimedia platform, compatibility with loyalty cards, couponing and the ability to provide virtual education on hypertension, diabetes and obesity. Mariano’s operates 28 supermarkets, including 24 with pharmacies, in the Chicagoland metropolitan area. Overall, Roundy’s operates 148 retail grocery stores and 97 pharmacies under the Pick ‘n Save, Copps, Metro Market and Mariano’s banners in Wisconsin and Illinois. Ashton Maaraba, chief operating officer at PharmaSmart, called the pilot at Mariano’s “a tremendous success” and said the PS2000 Destination not only bolsters PharmaSmart‘s product portfolio but also its clinical standing. “We remain focused on delivering both a high-quality brand and revenue from easy-to-administer clinical services to all clients. We are grateful to clients such as Mariano’s for their commitment to deliver quality health care services by relying on the PharmaSmart brand,” Maaraba stated. PharmaSmart said its PS DataSmart health IT database currently holds more than 30 million targeted patient blood pressure readings. ROCHESTER, N.Y. — PharmaSmart International has signed a deal with Sav-Mor/Sav-On Pharmacies to supply its kiosks in the Michigan-based retail pharmacy network’s stores, PharmaSmart said Friday. PharmaSmart will install its blood pressure and pulse kiosks in the stores, and patients will be able to access their Blood Pressure Tracker personal health records at Sav-Mor’s and Sav-On’s websites. Pharmacists at the stores and local physicians will be able to better manage patients with high blood pressure and related health conditions, and patients and their providers will be able to use the PharmaSmart personal health record to access the Department of Health and Human Services’ Million Hearts risk-assessment platform, part of a program aimed at preventing 1 million heart attacks by 2017. Sav-Mor/Sav-On plans to use the system for its new Blood Pressure Club, which will be the foundation of the network’s wellness programs. ROCHESTER, N.Y. – PharmaSmart International Inc. has entered an agreement with PDX Inc. in which PharmaSmart health screening kiosks will be integrated with the PDX Enterprise Pharmacy System and patient clinical data stored in PDX’s Rx.com Enterprise Pharmacy Record. PharmaSmart said Friday that, with the integration, pharmacies using the PDX EPS that install PharmaSmart kiosks will be able to collect data from patients who use the PharmaSmart devices for clinical tests, such as blood pressure and weight. For patients who opt in, the clinical data is recorded on the patient’s record in EPS as well as on that patient’s centralized health record within the Rx.com EPR. The integration also facilitates notification of pharmacy staff when severe/urgent lab values indicate intervention is required. Patients using the kiosk receive a smart card that connects them to their individual PharmaSmart profile. Via the integration, pharmacists get access to a clinical portal that provides a comprehensive overview of the patient’s historical biometric data. PharmaSmart said the new biometric integration triggers timely patient interventions, counseling sessions and increases MTM/cognitive health assessments for hypertensive, obese and diabetic patients. Additional tracking from validated PharmaSmart biometrics is downloaded in real time to the patient’s record on the PDX EPS. Plans call for the PharmaSmart technology will be available in the PDX EPS next year. MISSISSAUGA, Ontario – Rexall Pharma Plus is partnering with Rochester, N.Y.-based PharmaSmart International Inc. on medication therapy management.The alliance integrates PharmaSmart interoperable biometric screening technology with Rexall’s dispensing system. The integration triggers timely patient interventions and counseling sessions, and increases MTM for hypertensive patients. Rexall pharmacists are presented alerts within the electronic patient record, which informs the pharmacist of the patient’s specific biometric screening status. Icon status is based on average readings and, in the most severe cases, urgent alerts trigger immediate intervention and referral to follow-up care when indicated. Also, the pharmacist has access to an advanced clinical portal allowing an in-depth overview of the patient’s biometric history. This data is integrated into standardized medication review sessions, and comprehensive program data is available to assess risk stratification and biometric trending geographically and across the full patient population. © 2013 Chain Drug Review Al Rights Reserved. ROCHESTER, N.Y. – Pharmacists at Astrup Drug Inc. are more in tune with their patients’ health since integrating PharmaSmart biometric screening technology with the regional drug chain’s Rx30 pharmacy system. PharmaSmart International Inc. reported Friday that the integrated biometric solution, now deployed across Astrup’s store network, is triggering timely patient interventions and counseling sessions, as well as boosting medication therapy managment (MTM) case recruitment for hypertension patients. Austin, Minn.-based Astrup has 21 pharmacies in southern Minnesota and northern Iowa. Via the solution, which links the chain’s pharmacy system with PharmaSmart’s health screening kiosks, Astrup pharmacists are presented with color-coded icons in the patient health record, alerting them to the patient’s biometric screening status. Icon status is based on average readings, and in the most severe cases flashing red icons indicate the need for immediate intervention. The process eventually initiates a referral to the pharmacist for follow-up care with the patient. By clicking on the program icon, the pharmacist accesses an advanced clinical portal that provides an overview of the patient’s biometric history, according to PharmaSmart. That data is integrated into standardized medication review sessions. In addition, comprehensive program data is available to assess risk stratification and biometric trending geographically across the full patient population. “With chronic diseases such as hypertension, drug therapy is complex and medication adherence is a major challenge. This creates a costly care gap that the pharmacists can help address, if they have the right tools,” Tim Gallagher, chief operating officer at Astrup Drug, said in a statement. “This investment helps our pharmacists obtain a higher-quality cognitive assessment, which supports the objectives of the patient, the physician and the health plan. Gallagher noted that the integration, announced in March, creates “a real-time, permanent bridge” between the PharmaSmart health kiosk and Astrup pharmacists. According to Ashton Maaraba, chief operating officer of PharmaSmart, more biometrics are being added to the PharmaSmart platform. ROCHESTER, N.Y. — Blood pressure screening kiosk maker PharmaSmart International Inc. said its Smart Card product now conforms to the Billing Unit Standard (BUS) of the National Council for Prescription Drug Programs (NCPDP). PharmaSmart said Wednesday that its Smart Card also has been listed in national drug databases, including Medi-Span, Redbook, Gold Standard and Center. The action enables uniform listing of the product’s billing unit among the national drug databases to facilitate consistent and accurate billing and reimbursement, according to the company. PharmaSmart’s personal blood pressure Smart Card confidentially stores and channels a patient’s biometric readings from its kiosk technology to pharmacy systems and physician electronic medial records (EMRs). “We are pleased to have our SmartCard conform with NCPDP’s Billing Unit Standard to ensure accurate billing and reimbursement, and also have our core patient care tool listed in national drug and device compendia. This allows us to more easily connect providers, health plans, and pharmacists in the collaborative support of hypertension patients,” stated Josh Sarkis, senior vice president of strategic business development at PharmaSmart. “The PharmaSmart Smart Card can now be e-prescribed and listed in national formularies. This enables improved medication therapy targeting blood pressure control, not just adherence, and a clinical reimbursement model that is integrated into standard pharmacy workflow,” Sarkis explained. PharmaSmart said it’s an active participant in NCPDP Work Group 10 professional Pharmacy Services (WG10) to help develop support for the inclusion of pharmacy-sourced patient biometrics in medication therapy management communication and documentation standards and electronic health records (EHRs). On Wednesday, PharmaSmart also announced the hiring of Laura Topor, an NCPDP veteran with strong pharmacy benefit manager (PBM), health plan and retail pharmacy experience, to spearhead the development of its managed care/payer relations programs. © 2014 Chain Drug Review All Rights Reserved. ROCHESTER, N.Y. — PharmaSmart International’s blood-pressure screening program is in use in all the stores of a regional retail pharmacy chain in the Northeast. PharmaSmart said it had deployed the peer-reviewed and clinically validated program at Kinney Drugs, which operates 97 stores in upstate New York and Vermont. PharmaSmart manufacturers and distributes the kiosks and interoperable health information technology systems and called the rollout a “major milestone” for the company following its recent relocation into a new, 53,000-sq. ft. headquarters in Rochester, N.Y.
PharmaSmart said its network of kiosks had collected and stored more than 16 million patient readings on its server, which it said would allow Kinney pharmacists to conduct timely reviews with patients who don’t have their blood pressure controlled and thereby help them achieve better health outcomes. ROCHESTER, N.Y. — PharmaSmart International’s comprehensive blood pressure program has recently been validated in two new, independent scientific studies, the company announced today. The company also announced a partnership with Rx-30 Pharmacy System that offers an automated clinical integration of validated PharmaSmart biometrics within the patient record. December 2012 issue of Blood Pressure Monitoring featured a survey titled “Are Kiosk Blood Pressure Readings Trustworthy?” The peer-reviewed survey, which was not funded by PharmaSmart, recognized PharmaSmart as the only blood pressure kiosk device to produce evidence of compliance with the AAMI/ISO international accuracy standard. The survey author, Bruce S. Alpert, M.D., called on the Food and Drug Administration and device buyers to demand that blood pressure kiosks meet or exceed the AAMI (ISO) standard. Dr. Alpert also addressed the issue of blood pressure kiosk cuff sizes, citing the fact that most kiosks are designed only for the average adult arm and are too small for about 50% of the U.S. adult population. He stated, “Inappropriate cuff size is a leading cause of inaccurate results.” PharmaSmart employs a patented cuff that accommodates the arm size of approximately 97% of the U.S. adult population. Alpert’s article concluded with a call for stronger regulatory oversight, stating “We should encourage the FDA to take a more proactive role” in the regulation of blood pressure kiosk devices. Chain says it is first in Pacific Northwest to deploy new kiosks from Rochester, N.Y. – based company. Seattle – Bartell Drugs has introduced PharmaSmart blood-pressure testing kiosks at all 58 of its stores, the regional retail pharmacy chain said Monday. Bartell said it was the first drug store chain in the Pacific Northwest to provide the new kiosks, made by Rochester, N.Y. – based PharmaSmart International. ROCHESTER, N.Y. — PharmaSmart International and Microlife will offer an integrated assessment of cardiovascular health risk factors to healthcare providers under a new partnership between the companies. PharmaSmart and Microlife said they would bring together their technologies, market presence and expertise to provide pharmacists, payers and providers with an integrated patient diagnostic screening system, with combined screening venues to include community pharmacies, workplaces, homes, medical clinics and ambulatory monitoring. PharmaSmart is a manufacturer of health kiosks and related services that works with pharmacy retailers, workplaces, military bases, health clinics and hospitals in North America. Microlife, based in Taiwan, manufactures medical measurement devices for clinical and home use. The partnership will include an integration of Microlife’s Watch BP product line into PharmaSmart’s BPT Suite data network, which in turn delivers patient-specific biometrics electronically to providers and patients through electronic health record integration and to patients through mobile devices and Web portals. ROCHESTER, N.Y. – PharmaSmart International Inc. has promoted Ashton Maaraba to chief operations officer, a newly created position. The blood pressure management, health IT and pharmacy health services company also said this week that it has hired Matthew Bryant as corporate controller and former Safeway Inc. executive Dave Fong as a strategic adviser to pharmacy services initiatives. In the new post, Maaraba will lead PharmaSmart’s global operations, sales and marketing, production, customer service and corporate development. A veteran of the pharmacy services and health/beauty products sector, Maaraba joined PharmaSmart in 2008 to lead global sales and marketing initiatives. Fong previously served as senior vice president pharmacy operations for Safeway. Bryant brings 14 years of accounting experience to PharmaSmart, where he will be leading the finance division. He formerly was controller for Flower City Printing, a national printing company. Rochester, N.Y.-based PharmaSmart serves over 6,000 locations, including retail pharmacy operators such as Wal-Mart Canada, Nash Finch, Safeway Canada, Coborn’s, Loblaws, Roundy’s, Smart Med Rx, Leader, Good Neighbor, Jean Coutu, Shoppers Drug Mart, Rexall/Katz Group, Zellers, Sobey’s Lawton’s, Astrup Drug, Winn-Dixie and Big Y Foods. ROCHESTER, N.Y. – PharmaSmart International Inc. has devised a Total Blood Pressure Management platform that the company said elevates the role of pharmacists in medication therapy management (MTM) and chronic disease management (CDM). The blood pressure screening system provider said Monday that the platform, demonstrated at the recent NACDS 2011 Pharmacy Services and Technology Conference, features patented health IT solutions connecting the patient, physician and pharmacist through an integrated care network, enabling targeted patient intervention, improved medication adherence and program validation via advanced metrics reporting. At NACDS conference, PharmaSmart showcased the benefits of its universal blood pressure cuff, which the company said provides accurate results for the rising obese population. Published research has noted that people with arms over 13 inches in circumference are unable to use blood pressure kiosks found in most pharmacies. That translates to 37% of U.S. adults, many of whom are obese and at high risk for cardiovascular disease, according to PharmaSmart. PharmaSmart also unveiled its new MTM software, BPT-Rx, which integrates directly into the pharmacy software system and links PharmaSmart automated blood pressure results directly to the enrolled patient’s electronic profile. The company said BPT-Rx supports improved patient enrollment and targeted patient intervention based on established clinical guidelines without interrupting core pharmacy workflow. “Pharmacists using BPT-Rx can easily submit outcome-based case reports to receive qualified payer reimbursement,” noted Sarkis. In addition, PharmaSmart demonstrated its PS DataSmart database and analytics engine, currently housing over 12 million patient blood pressure readings from across North America. PS DataSmart Analytics provides clients with direct, transparent access to program metrics, enabling them to track by-store/by-day usage, program enrollment rates, hypertension rates and trends, and other metrics such as cholesterol, diabetes and body mass index (BMI) to validate the program and guide MTM strategies, the company said. Ashton Maaraba, chief operations officer at PharmaSmart, pointed out that “historically, blood pressure kiosks have been positioned as advertising vehicles, and not chronic disease management support tools” that pharmacists can use. Maaraba added that PharmaSmart takes a grassroots approach to building patient engagement in clinical services. ROCHESTER, N.Y. – PharmaSmart International has unveiled new advances in its blood pressure diagnostic and health IT platforms that it said can help pharmacists expand their role as health care providers. PharmaSmart said this week that it has launched a “breakthrough” blood pressure cuff and an advanced health IT platform. The technology advances improve clinical validity of pharmacy-based hypertension programs; improve patient counseling, education and rates of adherence; and offer “unprecedented” program validation through metrics reporting, according to the company. PharmaSmart’s latest kiosk offers Internet connectivity, patient data tracking and patient health record integration. “PharmaSmart now combines a clinically validated diagnostic tool with an easy to use health IT platform to offer pharmacists meaningful tools for better patient care. This represents a new era of clinical pharmacy services,” stated Ashton Maaraba, general manager and senior vice president at the company. The recently launched PharmaSmart connectivity network has collected and stored 4 million patient readings, including blood pressure, and the new additions of body mass index (BMI) and blood glucose, the company reported. PharmaSmart noted that retail pharmacies offering the program have enrolled tens of thousands of patients into its integrated patient management platform. Enrolled patients have access to a retail-branded personal health record that stores and organizes their diagnostic readings. Once patients are enrolled, pharmacists use the integrated Personal Health Record (PHR) functionality to provide informed therapeutic counseling and interventions as required. On the diagnostics front, PharmaSmart has released what it called a breakthrough cuff design for blood presssure testing. “Most people think all blood pressure cuffs are created equal. The company explained that traditional blood pressure cuffs come in multiple sizes — small, medium and large and that for accurate readings the proper cuff size must be selected for each patient. Yet studies show that in practice this is rarely done and blood pressure accuracy suffers. PharmaSmart noted that its patented, clinically validated cuff allows accurate measurement of arm sizes from small through large. Its latest cuff is accurate and effective for 97% of the United States adult population, including millions of large patients who are unable to use current blood pressure measurement kiosks. He added that PharmaSmart’s new cuff design positions it as a medical-grade, clinical tool for out-of-office blood pressure testing. ROCHESTER, N.Y. – Executives from PharmaSmart International have joined the Wegmans School of Pharmacy Advisory Council. The blood pressure screening technology manufacturer said Wednesday that senior vice president/general manager Ashton Maaraba and president and chief executive officer Fred Sarkis have joined the pharmacy advisory council, a committee aimed at identifying and initiating new academic and extracurricular opportunities. The PharmaSmart leaders began their first term by providing an educational grant in the form of donated technology: innovative blood pressure screening equipment and Web services for students and faculty to use as part of their training in chronic disease management and advanced patient education. PharmaSmart noted that both Maaraba and Sarkis have extensive experience in the retail and clinical pharmacy industry. ROCHESTER, N.Y. – PharmaSmart International Inc. has teamed up with AstraZeneca Canada to deliver tools and programs to pharmacists, doctors and patients for the improved management of hypertension. The blood pressure screening systems manufacturer said the partnership positions community pharmacy at the front lines of disease state management and will involve a select group of Canadian retail pharmacy participants. More details are upcoming, PharmaSmart added. Josh Sarkis, senior vice president and general manager of strategic business development at PharmaSmart, noted that it’s widely acknowledged that chronic diseases like hypertension are best managed with the help of community-based health professionals. PharmaSmart said its products and services are used by pharmacies, work sites and health clinics across North America, administering more than 65 million blood tests annually. NEW YORK A company that designs and markets blood pressure monitors has integrated with an online health information storage service. PharmaSmart International announced Wednesday the integration of its patient hypertension tracking portal, Blood Pressure Tracker, with Microsoft HealthVault, allowing users to access and share blood pressure readings from PharmaSmart’s network of pharmacy-based health kiosks. Users can obtain a “Smart Card” from a pharmacist, test their blood pressure and access readings online with Blood Pressure Tracker, copying their data to their HealthVault record.